In The Neutrino, Dr. Asimov guides the reader on a voyage of discovery toward one of the most exciting scientific phenomena in modern times: the neutrino, an atomic particle so small that it can penetrate even the densest matter—a particle smaller than any in the Universe! But, says Dr. Asimov, the first discovery of this unique scientific phenomenon didn’t occur through research. Instead, the neutrino was first conjured up by scientists who needed a “nothing particle” to make their equations come out even! In this astounding, fact-filled book, the amazing Dr. Asimov fills in the gap between the “invented” neutrino and the startling discovery of the real thing, describing in clear, easy-to-understand language the scientific sleuthing which brought the neutrino to unbelievable reality. Along the way, Dr. Asimov ranges over broad and fascinating terrain, from the dawn of experimental science and the discovery of the atom to the ultimate encounter between science fact and science fiction: the neutrino! Meanwhile, this is an excellent little physics text. I like it a lot because it has a lot of equations, and I like equations— but I also like it a lot because of the foundational work. The first half of the book is dedicated to the philosophical foundations of science and why physicists were certain the neutrino existed decades before it was actually detected. What we get, then, is a careful description of the nature of scientific Laws of Nature and, in particular, of the nature and importance of conservation laws. Starting with examples which come from the familiar macroscopic world around us, Asimov moves from momentum through mass-energy, and on to charge, baryon number, lepton number, and so on. This careful and clear introduction to a fundamental aspect of the philosophy of modern physics is really the high point of the book—the neutrino is almost an after-thought, a text-book example of how and why this philosophy works. Of course, at the same time, the book is an interesting introduction to a large chunk of modern particle physics, and the neutrino in particular, and is worthwhile on that basis, too. Meanwhile, the book is a little dated. The current thought in astronomy is against the model of supernova formation recounted here, and although Asimov mentions tauons, he doesn’t talk about the fact that they are yet another “massive electron” with their own neutrinos. The book was also written well before it was established that neutrinos are not, in fact, massless. The Neutrino also has a slight stylistic flaw, in that it is rather foot-note heavy. 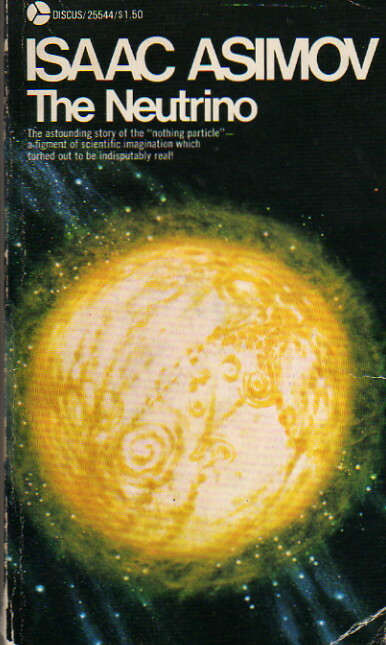 Asimov tends to festoon his non-fiction with footnotes under the best of circumstances, since he always wants to “stop and explain.” The Neutrino, however, is unusually heavy with them. Other than that, however, the book holds up well and remains a worthwhile volume indeed.